Why Did God Choose Jerusalem To Be The City Of God? Why did God choose Jerusalem over all the cities of the world to put His name? Jerusalem – City of Peace? Jerusalem is one of the oldest cities in the world, but the city hasn’t lived up to its name, at least not yet. Jerusalem means “king” (jeru) of “peace” (shalom), but it has been anything but a city of peace. This city which resides in ancient Palestine comes from the Hebrew word “Yerushalayim” meaning, “foundation of peace,” or the base (yarah) of peace (shalom). As I said, this city has been anything but a city of peace. It would be described as a city of contention or a stumbling block for the nations. In the earliest parts of Israel’s history, Abraham met a king, King Melchizedek, who was King of Salem (Gen 14:18), but whether this was the same city as Jerusalem or not, we cannot say for certain. It is at least possible. The point is Jerusalem is a very old city, but a city that has faced many wars. It has been rebuilt and destroyed dozens of times, and of all the cities in the world, it is believed to be the city where the most wars have been fought. It has been destroyed several times, attacked 52 times, besieged 23 times, and captured and recaptured at least 44 times. That’s some “city of peace!” So why would God choose to place His name in such a place? 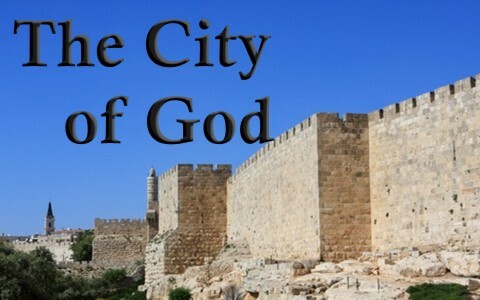 Why is the “City of David” so important to God? The city was not called Jerusalem in the beginning. At one time, before the Israelites came into the Promised Land, the Canaanites lived in the land of Canaan. By overthrowing the Canaanites, they scoured the land of the pagan practices of that nation which were an abomination to God, so the Lord said, “you shall devote them to complete destruction, the Hittites and the Amorites, the Canaanites and the Perizzites, the Hivites and the Jebusites, as the Lord your God has commanded” (Deut 20:17). Before they crossed over into the Promised Land, the Jebusites, a Canaanite tribe, inhabited Jerusalem about the time of Joshua’s conquest (Joshua 11:3 and 12:10). Jerusalem may be over what was once the very first city named Ophe, just above the Gihon Spring, which existed around 3500 BC. Why then do the Jews often refer to Jerusalem as the City of David? It’s possibly because He established the kingdom and ruled when Israel was at the zenith of its power. It is called the City of David because it is a city David built and established. He built and fortified the land like no other king of Israel, and that included a large portion of the fortifications at Jerusalem. The period in which King David ruled (1010-970 BC), was a period that Israel had the labor force and technology to begin buildings of such size that are suitable for a capital of such a centralized kingdom at that time. Even the Scriptures refer to Zion, or Jerusalem, as “the city of David” (2nd Sam 5:7). After David had built Jerusalem up, it was said that “David lived in the stronghold and called it the city of David. And David built the city all around from the Millo inward” (2nd Sam 5:9), so the Bible calls it the city of David. Zion, sometimes called Mount Zion, is synonymous with Jerusalem or the City of David (1st Kings 8:1). These names are all used interchangeably when referring to Jerusalem, so Zion refers to the land of Israel, the historical home of the Israelites, but the City of Zion refers to Jerusalem. It is a great place of religious significance to Israel. It says in 2nd Samuel 5:7, “David took the stronghold of Zion, that is, the city of David,” so we can see that the City of Zion is also the City of David, but Zion has special meaning in the Bible. The psalmist prays that salvation would come out of Zion (Jerusalem) (Psalm 14:7, 53:6), and “God will save Zion and build up the cities of Judah, and people shall dwell there and possess it” (Psalm 69:35), so Zion is more than a place. It is where God is and the people of God are to be. And best of it, it is where salvation came from, speaking of Calvary and the redemptive work of Christ, and as the Prophet Isaiah foretold; “Behold, I am the one who has laid as a foundation in Zion, a stone, a tested stone, a precious cornerstone, of a sure foundation: ‘Whoever believes will not be in haste” (Isaiah 28:16), but someday, “the ransomed of the Lord shall return and come to Zion with singing; everlasting joy shall be upon their heads; they shall obtain gladness and joy, and sorrow and sighing shall flee away” (Isaiah 51:11). Jerusalem can be called the City of God, the City of David, the City of Zion, or simply, Zion, but there is a greater Jerusalem coming, and it is all brand new and more glorious that anyone can describe. The Apostle John tried to describe it when he wrote, “Then I saw a new heaven and a new earth, for the first heaven and the first earth had passed away, and the sea was no more. And I saw the holy city, new Jerusalem, coming down out of heaven from God, prepared as a bride adorned for her husband” (Rev 21:1-2). Can we even imagine “the holy city Jerusalem coming down out of heaven from God, having the glory of God, its radiance like a most rare jewel, like a jasper, clear as crystal” (Rev 21:10b-11), and walls “built of jasper, while the city was pure gold, like clear glass. The foundations of the wall of the city were adorned with every kind of jewel. The first was jasper, the second sapphire, the third agate, the fourth emerald, the fifth onyx, the sixth carnelian, the seventh chrysolite, the eighth beryl, the ninth topaz, the tenth chrysoprase, the eleventh jacinth, the twelfth amethyst” (Rev 21:18-20)? This is the new city of God but what makes it the city of God is that God is in the city, as John writes that “the dwelling place[a] of God is with man. He will dwell with them, and they will be his people, and God himself will be with them as their God” (Rev 21:3), and “They will see his face, and his name will be on their foreheads” (Rev 22:4). Why did God choose to put His name in Jerusalem? Because God wanted to. It must have pleased Him, and that’s all that matters. All The kingdom is coming. More importantly, the King of the kingdom is coming. When, I can’t say, but it could be at any moment, so the best thing I can tell you is that if you’ve not settled your account with God by repentance and faith, it’s time to put your trust in Christ today (2nd Cor 6:2). He is either your Savior or He will be your Judge, and one is infinitely greater. Jesus tells us all before He comes back: “Whoever believes in the Son has eternal life; whoever does not obey the Son shall not see life, but the wrath of God remains on him” (John 3:36). Here is some related reading for you: What Does the Bible Say About the New Jerusalem? Previous post: Is The Atonement Limited Or Is It For All People? Next post: What Does It Mean to Grieve the Holy Spirit?